Home / Retirement / 401k & Investing Tips / 5 Top Stock Trades for Tuesday — Buy, Sell or Hold Tesla? 5 Top Stock Trades for Tuesday — Buy, Sell or Hold Tesla? During trading today, Micron fell back to support, while Tesla tanked on worries over its methods for generating a profit. 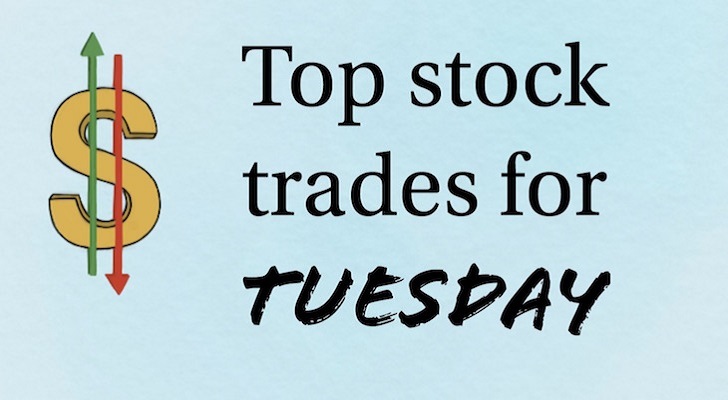 Here are our top stock trades for Tuesday. Monday is all about two things so far: the rotation into bank stocks (a trade we laid out perfectly, here) and Tesla (NASDAQ:TSLA). With the latter, the automaker saw its stock fall about 5% in early trading on news regarding Tesla and its suppliers. Shares have made up about half of those losses though and are back above $300. That much is important, but Tesla showed a big crack that bulls can’t be too comfortable with. On the charts, Tesla was setting up for a big move either way. Once it broke investors could try and play the move, but we weren’t going to try and guess which way it would go beforehand. Below trend-line support is not good, but it still has support between $300 and $310 — albeit barely. I don’t see much of a reason to go long Tesla at this moment. Further, with such a high short interest, I’m not too keen on betting against it either. If I am leaning one way, it’s with the bears right now. But there’s nothing wrong with watching Tesla from the sidelines. 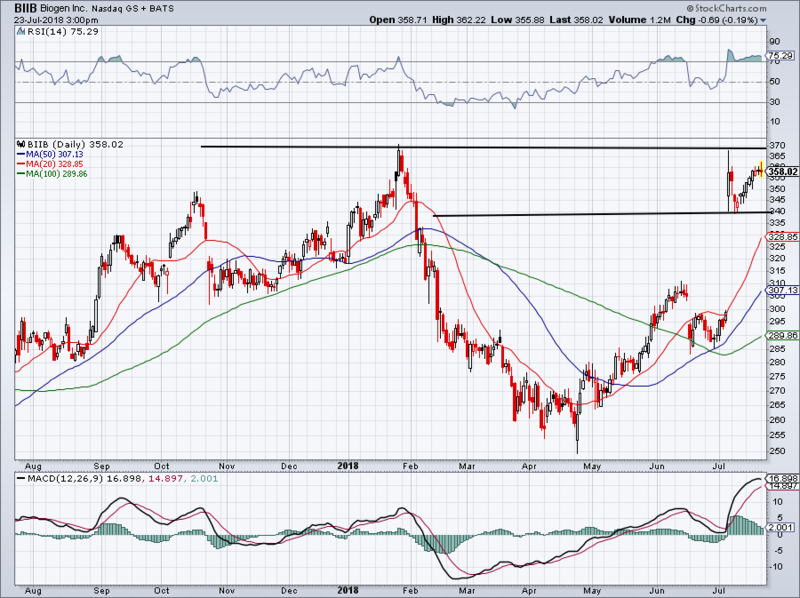 Micron (NASDAQ:MU) has been pretty quiet lately, but its pullback from $64 to $52 has to have some investors interested. 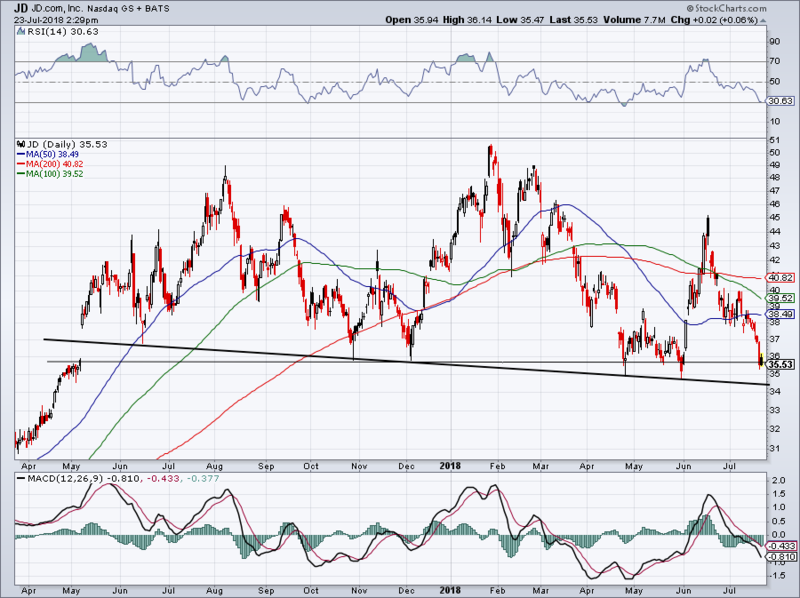 Trend-line support has held as MU continues to struggling gaining upside momentum. One way to trade it? Aggressive investors can play using this line of support and going long. 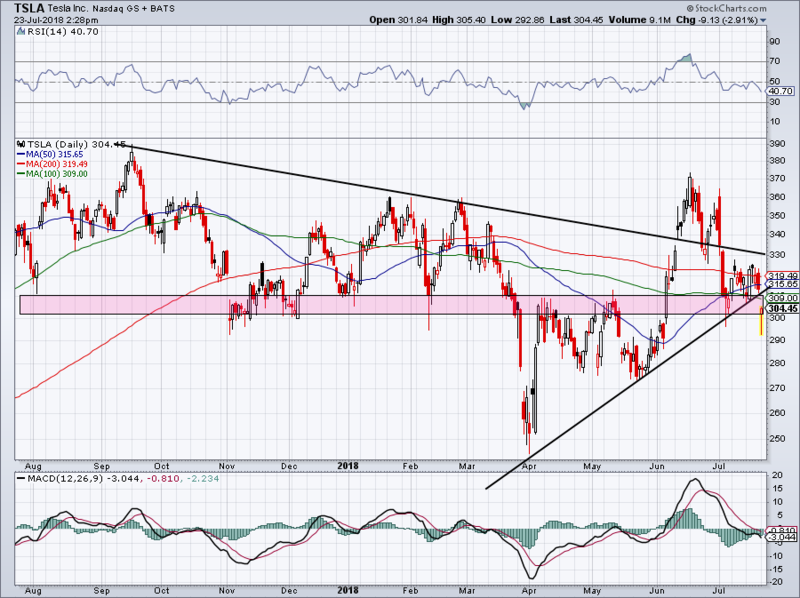 Conservative investors can buy MU on a breakout over downtrend resistance (purple line). General Motors (NYSE:GM) proved that it made an excellent investment when it gobbled up Cruise Automation. What reportedly cost about $1 billion in 2016 is an asset now being valued at more than $11 billion after SoftBank OTCMTKS:SFTBY) took a near-20% stake in it. GM shares soared on the news in June, getting up to $45. While the move was reasonable in my mind, $45 has proved to be tough resistance. Shares promptly declined to $39, which has become a vital level as well. Long-term investors who want a piece of GM can do so with a solid risk/reward near $39. Keep in mind it pays out a near-4% dividend yield too. 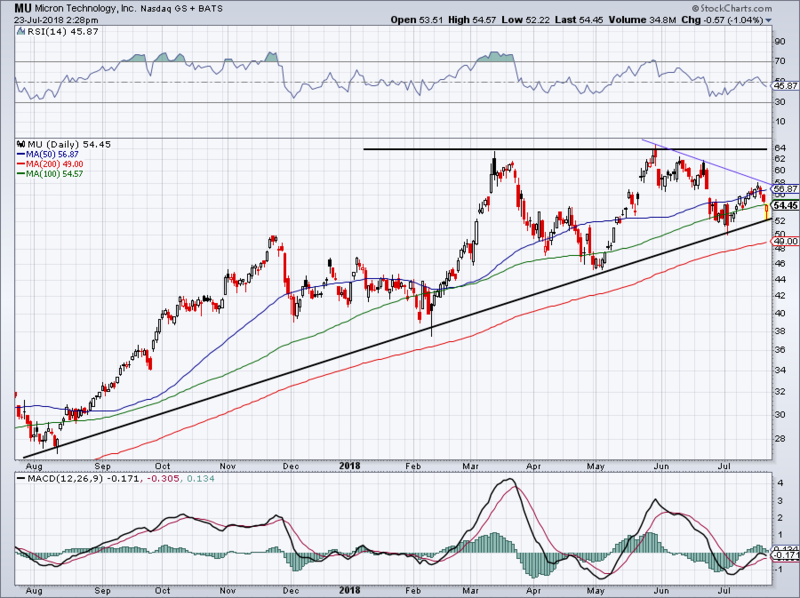 Should GM gain upside momentum, let’s see how it handles $45. 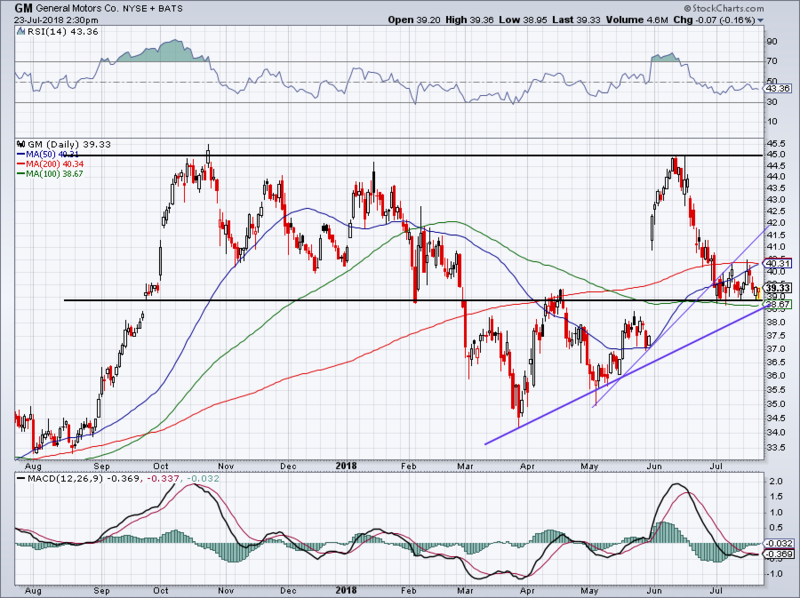 The $36 level was an important mark for me on JD.com (NASDAQ:JD). Once it lost it, shares put in a double-bottom near $35-ish. But it’s made this latest slide from $45 to $35 all the more concerning. The saving grace? Over time a downward trending line of support has developed. Right now, that comes into play near $34. JD doesn’t report earnings until August 13th. So if shares do fall to this level, we could have a potential long play on our hands. Some people have been wondering about Biogen (NASDAQ:BIIB). Shares gapped up from about $300 and ran to $370 in one day. In any regard, BIIB promptly pulled back to about $340. Now at $357-and-change, what should investors do? Conveniently, the have a range to trade. Below $340 and the 20-day and 50-day moving averages are in the cards. If $340 holds as support, BIIB could be rangebound for a bit. Over $370 and bulls should be interested in more upside. Keep it simple and don’t guess — let the trades come to you. Bret Kenwell is the manager and author of Future Blue Chips and is on Twitter @BretKenwell. As of this writing, Bret Kenwell held no position in any of the aforementioned securities. Article printed from InvestorPlace Media, https://investorplace.com/2018/07/5-top-stock-trades-for-tuesday-biib-jd-gm-tsla-mu/.